The bearded outdoor gurus down at your local outfitter don’t just stumble upon the latest gear when it shows up at camp or on the slopes – they seek it out. And the Outdoor Retailer gear winter show, held every year in Salt Lake City, is the spot to find the cutting edge. From 3D-printed insoles that perfectly mimic the contours of your feet, to the ultimate stretchy rain jacket for braving the endless drizzle of the Pacific Northwest, this year brought a slew of high-tech new gear we can’t wait to try. After getting home and knocking the snow off our boots, we’re ready to recognize the best of the best. While we appreciate small refinements that inch a product toward perfection, what really grabs our attention are the monumental leaps forward that send competitors scrambling back to the drawing board. And above all, we want gear that makes us want to get outside. 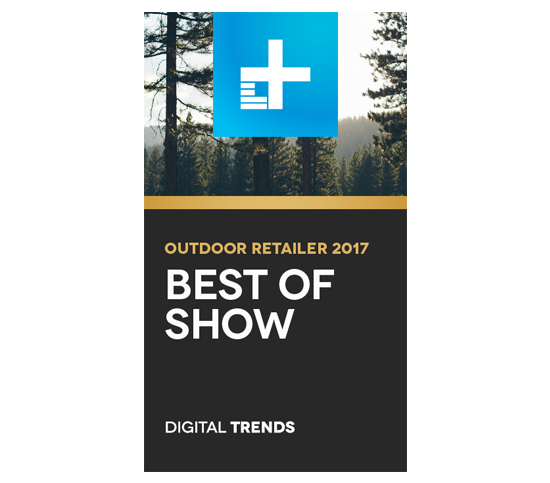 Here are the best new products and technologies from Outdoor Retailer Winter Market 2017. We’ve previously reported on Crescent Moon’s new snowshoe design made from EVA foam, so we were excited to try them out for ourselves at the All-Mountain Demo day at OR 2017. And these new snowshoes certainly delivered on all claims of being lightweight, flexible, cushioned, and agile. The rocker shape of the shoe allows us to bid farewell to the hinge, so there are fewer moving parts to fail or get iced up. Crescent Moon president and co-founder Jake Thamm says that the new design, “Looks like the love child of an Adidas running shoe and a Blizzack snow tire,” and we’re inclined to agree. Wearing these snowshoes, we could easily set a quicker pace and the surefootedness while on a slope was incredible thanks to the cleat design. Columbia’s new OutDry membrane technology is already the technical foundation for some of its best hard shells. Now, for 2017, Columbia’s adapted OutDry Extreme into outer fabric with four-way stretch properties. Columbia promises that the OutDry Extreme membrane on stretch material performs the same as on a rigid fabric, so there’s a big reason to be excited for those who want a soft shell with completely waterproof, breathable qualities. Our favorite piece from OR was the EX Mogul ski jacket, which is fully based on the technical specs of the official uniforms of the 2018 Olympic freestyle ski teams for the U.S., Canada, Russia, Ukraine, Kazakhstan, Belarus, and Brazil. If they’re fit for Olympians, they should be great for just about everyone. It’s highly unlikely that your foot is like mine, or that even your own two feet are exact mirrors of each other, which is why nothing beats a custom-made solution tailored for you. With the growing accessibility of 3D scanners and 3D printers, custom insoles and footwear are an obvious application of the technology, but it’s taken Superfeet, HP, and SafeSize to finally make this a reality. Starting spring 2017, select retailers will have special equipment that can perform a gait analysis and take a 3D scan of your feet. With that information, the computer will make recommendations on which shoes will best fit the feet, including the size. That information can also be used by a 3D printer to create custom Superfeet insoles or even a custom-sized recover slide sandal. What business does a glue company have at an outdoors show? Plenty. All that talk of “seam free” or “fully taped” is often thanks to an adhesive material that replaces the need for stitching. Bemis showcased Nylock, which sticks to smooth surfaces, such as nylon, and functions as both as an adhesive and functional aesthetic film. Bemis says Nylock is the “most robust” solution for nylon bonding in the world. We’ll put that to the test when it first shows up in 2017 designs from Uniqlo, which will employ Nylock in a new way to create bonded baffles that will reduce cold spots and prevent the loss of down. Patagonia will use Hyper Das – its warmest synthetic insulation yet – in a couple of its jackets new for fall 2017. The accordion-like insulation is extremely puffy and compressible, so it packs down easily but also springs back to life just as quickly. The promise is a material constructed from synthetics that can also perform like a down puffer – yet have a unique look and feel all of its own. The Hyper Puff hoody will have 100-gram insulation, while the parka will dial up the warmth with 200-gram Hyper Das. Mountain Hardwear’s StretchDown jacket was a favorite from last season, and for fall 2017 the Richmond, Calif. company has improved upon the design significantly with the DS, which has discontinuous baffles. The stretch-welded panels are better at trapping warmth than standard stitching, and the DS design is even stretchier than the regular StretchDown jacket, so it offers better range of movement. The 800-fill RDS down is treated with Nikwax to keep it effective even in the wet. The Mountain Hardwear StretchDown DS will be one of the most unique-looking jackets of fall 2017, and will retail for $340. We loved the modern aspects of the Goal Zero Yeti Lithium series of power stations, but sometimes solar just isn’t enough and you need to run off dino-juice. Rather than resort to the old ways of the traditional gasoline generator, Goal Zero will be rolling out its own gas-powered generator. That’s mighty brave for a company that sells eco-friendly power solutions, but the Yeti Fuel is different. Instead of running constantly, like a traditional generator, the Yeti Fuel delivers direct current right to a Yeti Lithium 1400 or 3000 and will automatically shut off once the power station is adequately charged. For those who need power around the clock but also desire peace and quiet, the Yeti Fuel can top off the Yeti Lithium prior to quiet hours so you can run even a refrigerator through the night. Look for it this fall for around $1,000. How much should you spend on your helmet? Well, that depends on how much you think your head is worth. OK, so that’s not entirely true: Helmets sold in the U.S., EU, and many other markets have to adhere to minimum safety standards. Buying a more expensive helmet doesn’t always mean you’ll get increased protection, but Smith’s new Quantum helmet does a lot to justify its $300 price tag. It features an Aerocore construction (like a honeycomb) with Koroyd, which replaces the foam shell altogether, making it better for airflow and, along with the Smith Exoskeleton, better shock absorption. Finally, for those who hate fiddling with helmet straps and buckles with gloves on, the Fidlock is magnetized, so clipping on or off is an easy, one-handed operation. The Quantum goes high-end with a Boa system too, and a next-gen MIPS design dials up safety factor, too. Smith just threw everything it had into the Quantum, which is on sale now. Swappable lenses are a great feature of many goggles. Easy-swap is an even better, and thankfully increasingly popular trend. So, the race is on for who can make the best easy-swap system that won’t blow apart the next time you hold a yard sale. Zeal claims that its new Portal RLS (for Rail Lock System) is the “most advanced lens swap,” but we’d like to think of it as simple and reliable. The lenses drop into place through a fitted rail system, which is then held in place with strong magnets. This makes goggle changes possible – perhaps even easier – while they’re still on your face since you can just slide them on and off. Zeal’s Automatic+ photochromic lenses will come to the portal too, so you can have auto-dimming technology that’s easy to swap. This will hit stores next winter. Where some goggles use special coatings or even active fans to fight fog, Abominable Labs solves this problem with a heat-conductive element built right into the Carl-Zeiss made lens. This means that the lenses themselves aren’t cheap, at $100 each, but the first-generation product proved that they really do work. For the winter 2017 model, the Abom is getting smarter heating with a sensor that will automatically adjust according to conditions, which should save battery life. An ambient light sensor would also adjust the status LED, so it’s not too blinding or distracting in low light. We expect pricing to be similar to the current model at $250. An interesting piece of trivia: This goggle was originally called the F-Bom when first launched on Kickstarter. The original GoTenna was a smart and innovative way swap text messages without cellular service, but it had distinct and glaring limitations due to its point-to-point system. The second generation that will be released in 2017 will operate in the ultrahigh frequency (UHF) spectrum, whereas the original GoTenna uses waves in the very high frequency (VHF) spectrum. The real key upgrade in the GoTenna Mesh, as the name suggests, is the ability to work in a mesh network, which means that other GoTennas – even those not a part of your group – can act as a relay for your messages. This will go a long way in overcoming the limitations from the first product. Lithium-ion batteries drastically lose their performance capabilities in cold temperatures, which is both unfortunate and inconvenient for those who like to take their smartphones and other li-ion powered gadgets with them while on their winter adventures. Helly Hansen figured out a solution: Why not insulate the pockets from the cold as well as – or even better than – insulating your body? That’s the idea behind the Life Pocket, a new innovation that lines the outside wall of the pocket with PrimaLoft Gold Insulation Aerogel. Helly Hansen says that the Life Pocket keeps your precious device three times warmer than any other pocket, which means a happier, longer lasting battery for your snaps on the slopes. Invista’s intensely reliable fabric technology (commonly known as Cordura) is behind some of our most trustworthy bags and jackets. At OR 2017, the company showed off the most biggest cutting-edge breakthrough in designing and commercializing the strongest nylon staple fiber ever. After two years of R&D, Invista says that its scientists and technicians have successfully achieved one of the largest leaps in its nylon innovation in 45 years. Cordura Nyco (nylon/cotton) blends using Invista T420HT are already undergoing trials for next-generation combat uniforms by a major military. Dickies is the first consumer brand to adopt the technology in its fall 2017 workwear, but we hope to see outdoor gear with Cordura Nyco soon. 3M released its initial Thinsulate Featherless Insulation at Outdoor Retailer in 2014, and this year returned with the second generation of Featherless, which has an equivalent fill power of 700, besting the previous generation’s 600 fill power rating. While Marmot skipped on the first generation of Featherless, the company partnered with 3M in testing and developing generation two. Those looking for an alternative to down that best mimics the wonderful, pillowy feel of genuine feathers could be best served by the latest Featherless insulation. Unlike other synthetic insulations that are sewn into jackets, Featherless can be blown into jacket baffles to help recreate the feel of down without committing fowl play.